Order your Elixir OPTIWEB 7-String Electric Guitar Strings from AMS and enjoy Fast & Free Shipping. Get the Best Deal with our Lowest Price Guarantee & Great Customer Service! 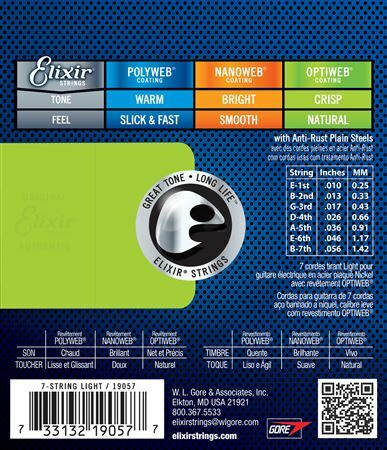 The incredibly natural feel of Elixir’s new OPTIWEB strings provide players with not just a great coated string, but a great string, period! 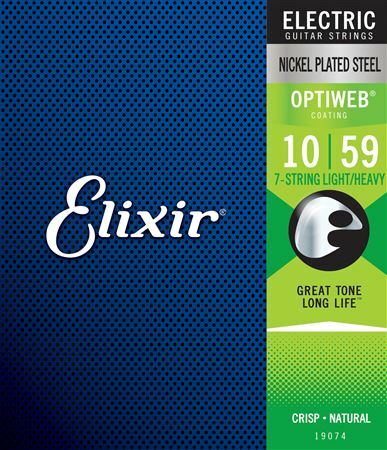 Compared to Elixir’s POLYWEB Coating and NANOWEB Coating, the OPTIWEB Coating on this 7-string electric set offers the most natural and familiar feel to date, while retaining all the long-lasting qualities you’ve come to expect from Elixir. This lightweight coating allows the string to vibrate with less damping, while also having a firm grip, putting you in control of bends, vibrato and sustain.